Flores Financial Services, Inc. was originally established in 1982 and has continued to grow as a well-known and respected financial services provider. We conduct business with clients throughout California, Arizona, Texas, Hawaii, and the Midwest. Flores Financial provides quality accounting services, from startup planning to ongoing business administration and compliance support, including bookkeeping, payroll, budgeting, customized financial reporting, and consulting services. President and Owner, Mr. Gregory Flores developed a Human Resource department which has proven to be a valuable, added service for all of our clients. The department offers a full range of human resource services, from employee selection, orientation, and training programs to the administration of benefit plans, workers’ comp, and unemployment insurance. 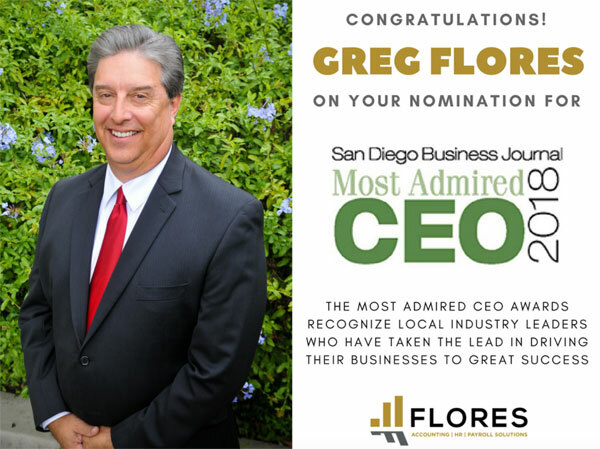 Flores Financial Services is committed to delivering excellent service to each and every client, establishing quality business relationships, providing a safe, dependable working environment for our employees, and establishing Flores Financial Services as a leader of integrity and value in today’s business world. We provide a full suite of accounting services from Accounts Payable to CFO consulting. FFS has the ability to become your full resource accounting department. Our human resources department can keep your business legally compliant while working with you to administer a variety of programs beneficial to not only you as the employer but to your valued employees as well. Our team’s dedication to detail and our Flores payroll insights platform ensures a seamless payroll process. We are here to help whether it’s to get your books straightened out or a new restaurant ready to start off on the right foot.